Embroidery is part of every Dao woman's daily life and through this she perpetuates the identity of the Dao culture by reproducing the patterns which have developed over generations of Dao women. 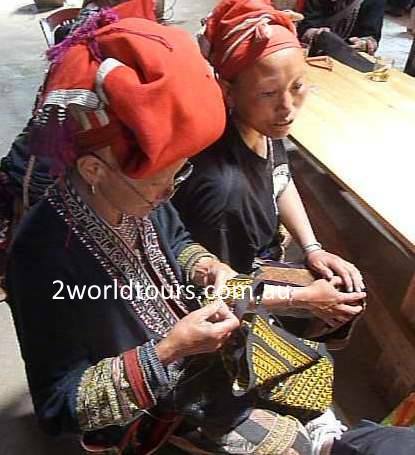 Generally a Dao woman is so skilled in her embroidery skills that she only needs to briefly see a pattern and is able to copy it. Dao women and girls spend most of their free time embroidering, you can see them stitching away whether they are resting in the fields, on the way to market or sitting chatting with other women or family – they never waste a spare second of their time. 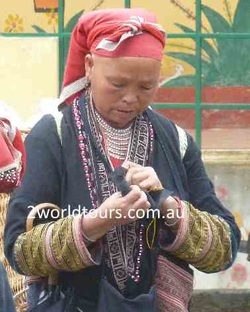 When making her clothes a Dao woman will embroider each section of clothing separately then assemble the outfit using additional pieces of indigo cloth. 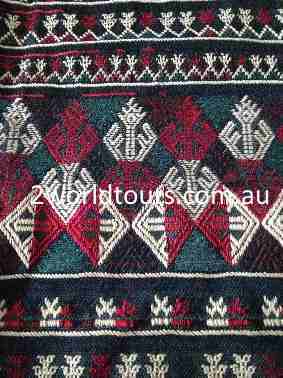 Although finished garments appear the same, the colours and motifs vary from garment to garment, and new motifs are copied from each other and in some cases from their Hmong neighbours. 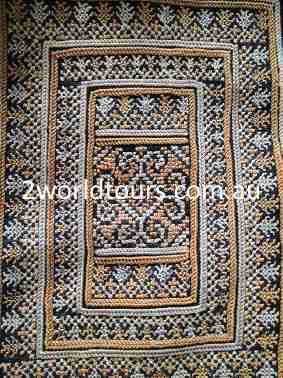 The symbols and design motifs used in Dao embroidery are drawn from the natural world using the five colours of their ancestor Ban Ho (who was said to be a five coloured dog). 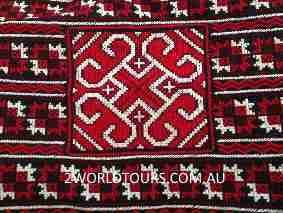 Symbols, motifs and patterns common to Dao embroidery include: bamboo, pine tree, peach blossom, paw prints of tigers, monkeys and bear, images of people, horses and birds, and the spirit of thunder. The embroidery technique of the Dao is quite unique. They don’t use a frame or have any recorded patterns. Young girls start learning simple patterns from 8 or 9 years old and gradually learn all the traditional patterns over time, however each woman imparts her personality and symbols into her individual designs and clothing. In some clans a girl learns to embroider by making an indigo scarf which she decorates in stars and traditional motifs – it’s said that there are no 2 scarfs the same as each girl learns to develop her own individual style and interpretation of traditional patterns. 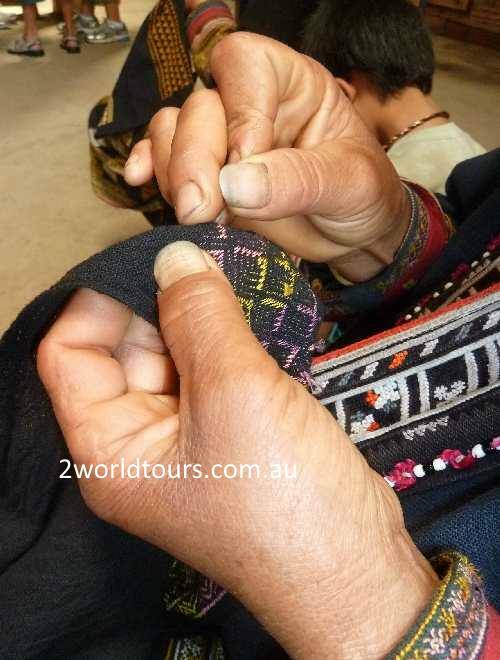 Traditionally the Dao use a base fabric of dark indigo which is either a hemp they buy from their tribal neighbours the Hmong or a cotton fabric bought in the market. In the past the Dao used to produce a lot of their own cotton fabrics but like everything these days it’s cheaper and more time effective to buy ready-made cloth. 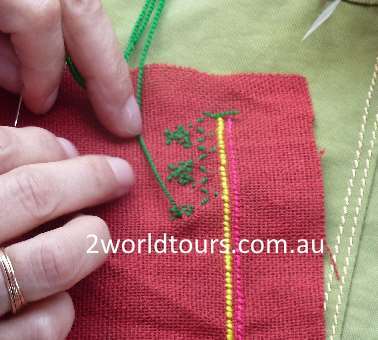 All embroidery is done from back to front in lines, using the full length of the needle as you count the threads to create your pattern – a little like counted cross- stitch (on steroids!) 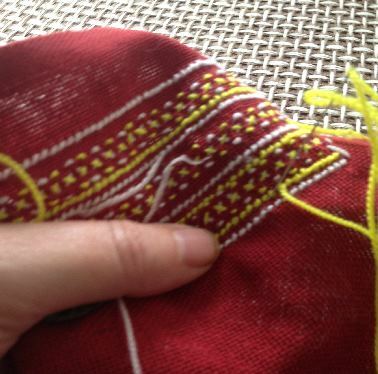 as they use a variety of stitches to create the patterns. It’s not until you turn over your piece that you can see the actual design - which is a strange concept for us western inspired embroiderers that like to see our progress unfold as we stitch. 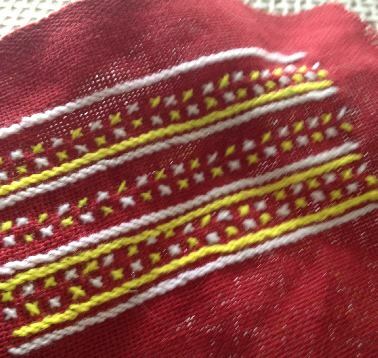 Even the order they embroider colours has a traditional method – first you do the black which is then followed by the other colours of Dao embroidery – yellow, white, red and green/blue. Although with the use of commercially purchased silk and acrylic threads the colour palette is more varied these days and it’s not uncommon to see various shades of blues/mauve and orange in some women’s designs. Its also quiet common to see younger women creating new modern designs using really bright colours to sell to the tourist market, especially around the Sapa region.